The paintings of Vincent Van Gogh are some of the most instantly recognisable images anywhere in the world. But why is this so and where did they come from? Of all artists, the life of Van Gogh seems supremely suited for the big screen, with its mixture of youthful hope, artistic passion and personal tragedy. This beautifully structured documentary directed by David Bickerstaff reveals the man behind the paintings as human rather than the mythic figure of his final traumatic years. Scene one is the Van Gogh Museum in Amsterdam where the viewer is taken behind the scenes of a major rehang, meeting the curators, researchers and others who explain how and why they choose to present Van Gogh to today’s visitors – from an intense room of twelve self-portraits, to another which attempts to put the artist in context, beside his friends and contemporaries as well as within a broader art history which influenced and inspired him. Vincent’s letters to his brother Theo, written throughout his life and kept by Theo’s family until the museum was opened in 1973, are an invaluable resource. These document not just the events that shaped the artist but his every emotional reaction; narration and images of these (often illustrated) letters, together with panoramic views of the landscapes that Van Gogh passed through and lived in, creates a deep sense of understanding of a man so famously misunderstood during his lifetime. And they remind one that there were many years before the great ‘masterpieces’ were painted, during which Van Gogh trained to be an art dealer, a school teacher, a preacher, and eventually dedicated himself to art – but initially intending to work as an illustrator for the press. The sensitive critical analysis of the curatorial team, the carefully edited excerpts from Vincent’s correspondence and the visual feast of Van Gogh’s paintings in close-up combine to create a spell-binding 90 minutes. Plus, with the Tate Britain exhibition, Van Gogh and Britain, just announced for next spring, this is the perfect re-introduction to an artist who never ceases to astound. Vincent van Gogh: A New Way of Seeing is an Exhibition On Screen film, directed by David Bickerstaff and produced by Phil Grabsky – in all major cinemas as well as local independent cinemas from 20th March 2018. With thanks to Seventh Art Productions for the images and stills. This article was first published on Candid Magazine’s website. The restrained vibrato of strings with a Spanish twang accompanies the mysterious steps of stockinged legs before the figure of Goya appears and his voice is heard, reflecting on poetry and art – then with a triumphant crescendo the title unfurls on screen. This is the wonderfully cinematic introduction to ‘Goya – Visions of Flesh and Blood’, a feature length film presented by Exhibition On Screen. Pioneers of exhibition films for cinema, Exhibition On Screen was the brainchild of Phil Grabsky, director and producer at Seventh Art Productions; beginning a few years ago with ‘Leonardo’, he works with Arts Alliance Ltd to bring these films to cinemas around the country. The idea works both as a means for those with limited mobility to see the exhibition on a scale and quality almost equivalent to first hand, while also acting as an extension and enrichment to a gallery visit. We begin in the National Gallery, with the institution’s director Gabriele Finaldi standing within the exhibition of ‘Goya: The Portraits’. Then the exhibition’s curator, Xavier Bray, begins our tour with an introduction to the artist at the beginning of his career as a portraitist, ‘crude’ and almost too direct; meanwhile art historian Juliet Wilson-Bareau draws our attention to the incredible interaction between the artist and sitter that Goya captures and which makes such a powerful impact. The camera pans in on the faces with the their dark eyes, alive and transfixing the us as if we were the artist behind the canvas. Only recently has the development of technology allowed such material to be reproduced to such a high quality on a cinematic scale – every detail is astonishingly clear, the brushstrokes almost tactile. 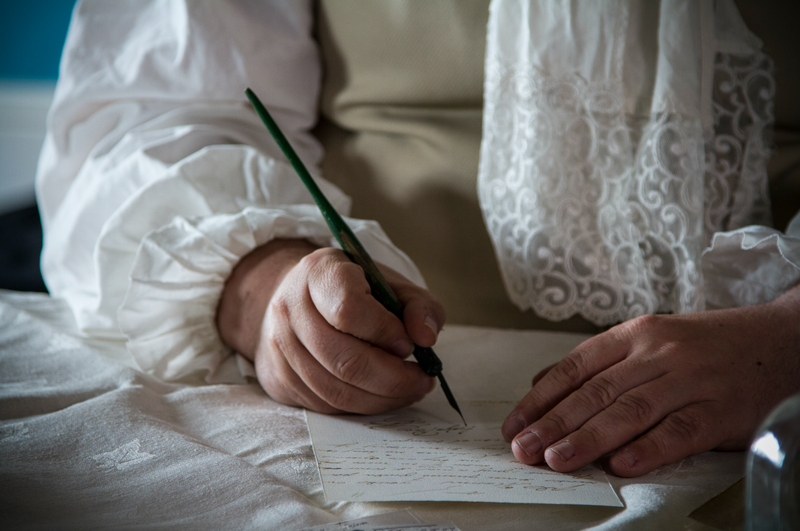 Then we are swept off to the landscapes of Aragon and Saragossa, immersed in the heat and colour of Spain while a brief biography of Goya’s early life is narrated. 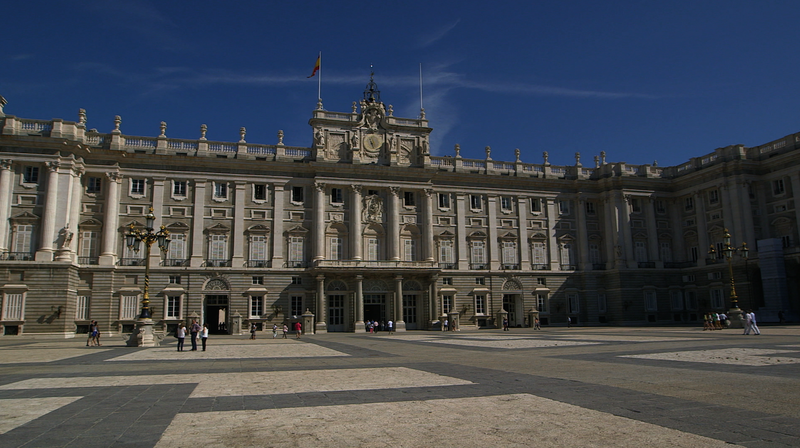 At each stage of his career we gain access to the surroundings that the artist would have inhabited: the Royal Palace in Madrid (above left) where Goya was official court painter to Charles IV, the country house Goya bought in his later years. 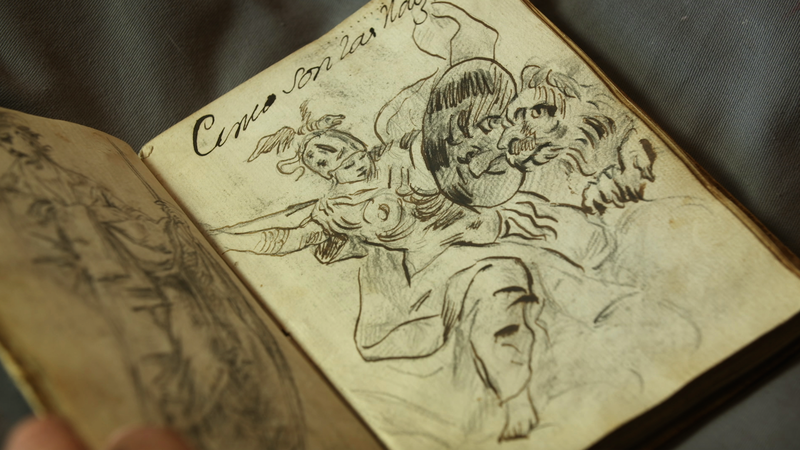 The film also allows us to see Goya’s letters (including those to his childhood friend Martin Zapater – full of scurrilous sketches, descriptions of food, his dogs, his finances and court intrigues) and his wonderful Italian sketchbook (above, c.1771) which is stored at the Prado in Madrid, as is the family portrait of Charles IV, forbidden to travel (below right), and which gives a fascinating insight into the working methods of Goya, the freedom of style and independent nature of this self-taught artist. 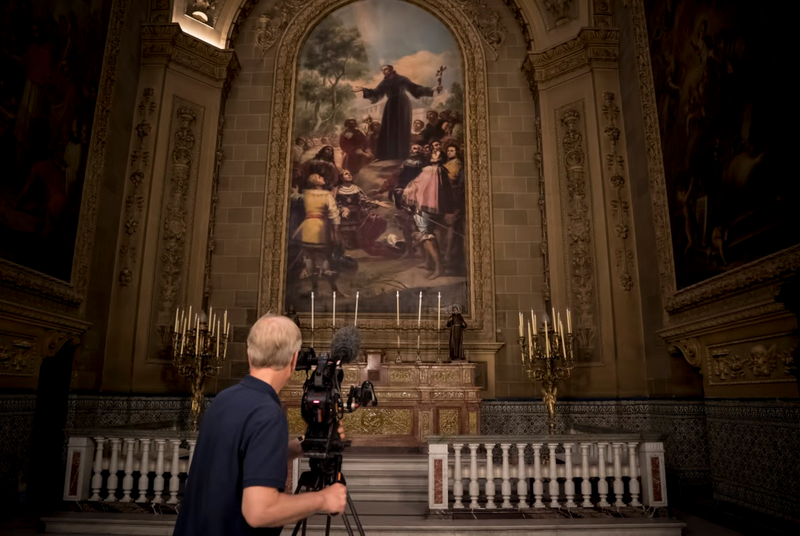 And, when it comes to his large-scale public commissions, such as his altarpiece for the chapel of San Bernardino de Siena in the Basilica of San Francisco el Grande, we are taken into the building itself where the camera glides over the architecture, showing off the grandeur and scale of the building and the accomplishment of Goya’s painting in its intended context (below left). 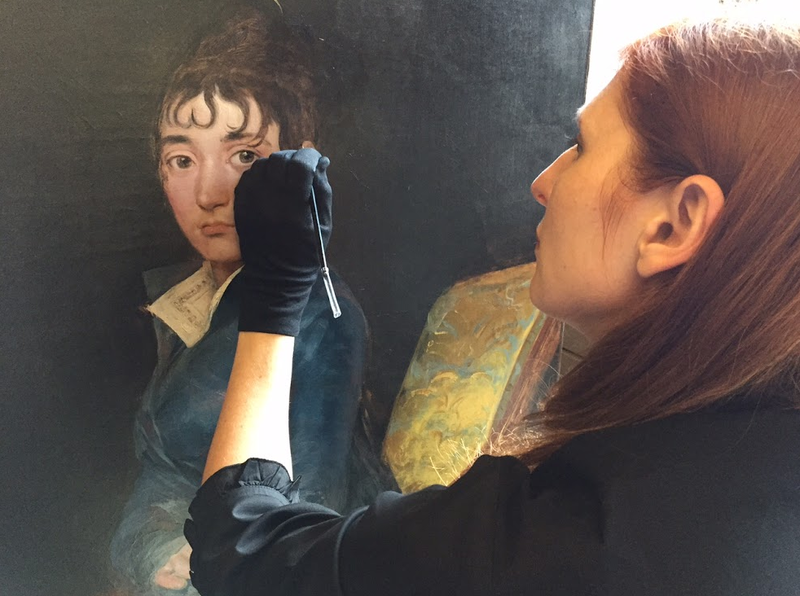 Later in the film we are shown behind the scenes in the National Gallery of Art, Washington DC – where a conservator, Joanna Dunn, talks about her work on the Portrait of Dona Teresa Sureda (below) – and into the studios of contemporary portraitists. Dryden Goodwin talks about the technical process of drawing, combining the humanity and physicality of his subjects, while Nicola Phillips, a ‘court painter’ of the 21st century having painted Princes William and Harry, talks of the relationship between artist and sitter, and of her admiration for Goya’s ‘extraordinary psychological grasp of personality’ and ‘extreme attentiveness to body language’. Frequently we return to the National Gallery, back to the curator and art historians, to the paintings themselves; the personalities are revealed, their costumes unpicked, the technical approach deconstructed so that each comes alive. 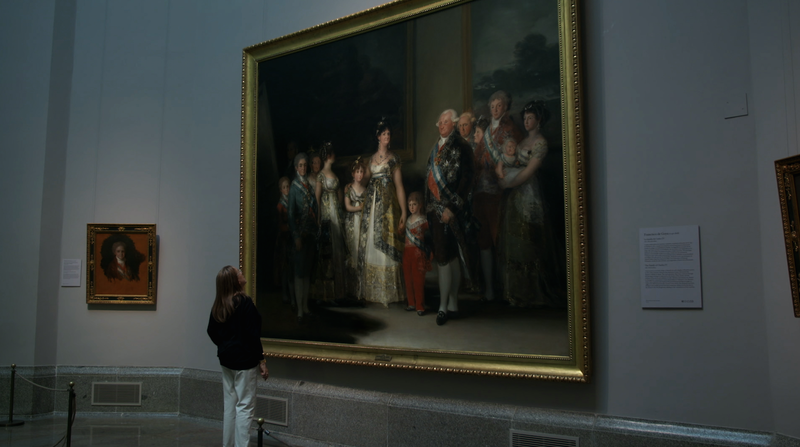 Letizia Treves, curator of Spanish Paintings at the National Gallery, describes Goya as a ‘truthful’ or ‘naturalistic’ painter rather than ‘realistic’, an artist who finds the essence of a sitter’s character, imbuing his portraits with an immediacy and humanity, and through his own depth of interaction putting himself into the portraits. 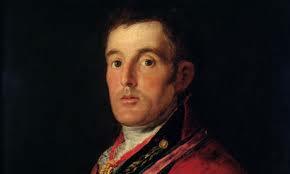 The idea of portraiture at this time in Spain was to be an equivalent to the real person; thus Wellington looks gaunt and tired, as if just this minute retired from the field at Waterloo (below); Don Andres del Peral, the court gilder and a colleague of Goya’s, looks out with eyes that are piercingly alive, in the process of turning to us in conversation. The film combines the best of the TV documentary tradition with the drama of the cinema experience – as director David Bickerstaff has emphasised, the film is an ‘emotional journey’, costume drama, history, biopic, and certainly very different to the more analytical progress one makes through a gallery. ‘Goya – Visions of Flesh and Blood’ will be released in cinemas nationwide from 1st December 2015. For more information visit www.exhibitiononscreen.com.